Click here to see an alphabetical list of BNI South Carolina Midlands chapters. See the map below for an overview of BNI South Carolina Midlands chapters. Click here to conduct an "Advanced Search" to locate a specific BNI South Carolina Midlands chapter. You may also call (803) 553-0790 or click here to send an email to visit a chapter. 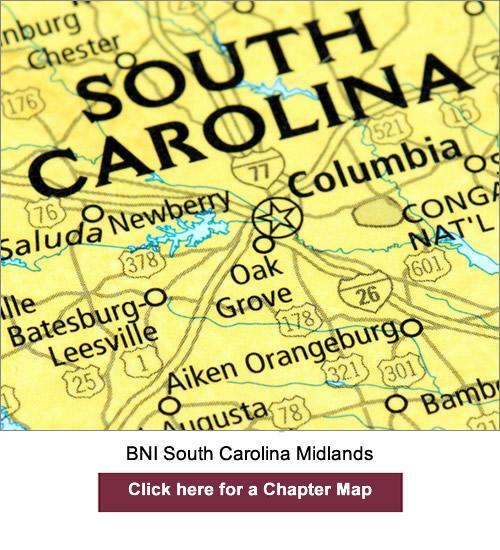 Click here to see the chapters currently forming in the BNI South Carolina Midlands region. If you are interested in starting a new chapter please call Shirley Towne, Executive Director BNI South Carolina Midlands at (803) 553-0790.